We Pay Politicians & The Media To Know What They Are Talking About – They Don’t! We Pay Politicians & The Media To Know What They Are Talking About – it is nothing short of a disgrace that They clearly Don’t have a clue! Despite their generous incomes, researchers and clearly excessive expenses! Sky News is telling us that the EU’s customs union “covers the 28 EU states, as well as Turkey, Monaco, San Marino, Andorra and non-EU UK territories such as the Channel Islands”. There is, however, a problem with that assertion: it’s wrong. Furthermore, it is very easy to ascertain that it is wrong – not least because the European commission helpfully provides the necessary details. On customs unions, the Commission is especially helpful, providing a web page which gives a strong clue as to its content, with the give-away title of “EU Customs Union“. There, it tells us that the 28 member countries of the EU form a single territory for customs purposes – known as “the customs territory”. That includes some (but not all) dependent territories, so it brings in the French colonies of Guadeloupe, French Guyana, Martinique and Reunion Island. It also includes the Isle of Man and the Channel Islands. Also, Monaco is considered to be part of the EU’s customs territory, specifically because of its special relationship with France. It does not, as yet, participate in the Single Market (in common with the Channel Islands). Incidentally, the UK Sovereign Base Areas of Akrotiri and Dhekelia in Cyprus are also deemed part of the EU customs territory, but three areas which are decidedly not part of that territory are Turkey, San Marino and Andorra. These, the Commission informs us have between them negotiated three entirely separate customs unions with the EU, each of them standing alone as separate agreements, such as this with Andorra. A point to make here is that if I can look this up on the Europa website, so can Sky News. And that organisation has vastly more staff, resource and money than I do, and has no excuse for getting such detail wrong. It is wholly irresponsible for it to allow such basic errors through the net, as it will be used as a source of information by others. But this is all part of the sloppy, low-grade attitude to facts displayed by the legacy media in general – which drove Pete to point out that the state broadcaster is just as bad, unable even to distinguish properly between the Single Market and the customs union. Lost Leonardo notes their confusion over the EU and EEA, observing that they were barely able to play catch-up. And such details are important. With Brexit, more than in virtually anything else in the public domain, the devil is in the detail and if the media are not up to speed on the fundamentals, then they won’t be able to pick up ministers and other politicos when they get it wrong. A case in point came yesterday when trade minister Greg Hands spoke to Bloomberg, telling the news agency that it was possible for the UK to seek a deal which would allow sections of the economy to remain within the EU’s customs union after Brexit. Officials, Hands said, would be able to choose the type of products to be covered by agreements. “You can choose which markets, which products the customs unions affect and which they don’t, so there isn’t a binary thing of being inside the customs union or outside of the customs union,” he said. In the Bloomberg report, he elaborates, saying that there were many models of customs union, where states group together to agree common tariffs for trading with external partners. The minister gave the example of the Zollverein. It was never “stuck in one place” as to which goods were covered and which weren’t, he asserted. “These things can be multifaceted and dynamic”. Yet the man is, of course, talking nonsense. In the 1830s, there was no WTO and currently, under its rules bilateral sector-specific deals (as between the EU and UK) would be considered to be discriminatory under WTO rules. That is not to say that sectoral deals cannot be made. They can – as in the 1997 WTO Ministerial Declaration on Trade in Information Technology Products (ITA). This had a group of 40 governments, including the US, Canada and the (then) EU Member States, cutting customs duties on computer and telecommunications products beginning on 1 July 1997, with the intention of eliminating them altogether by the year 2000. The point is that such limited agreements must be concluded under the aegis of the WTO and be open to all comers. This applies to all what are termed “plurilateral” agreements, such as the 1980 Agreement on trade in civil aircraft. The only other get-out is where any individual sectoral agreement is one of a sequence, with a defined timetable, leading up to a comprehensive trade deal (including customs unions). This was how Switzerland managed its bilateral agreements with the EU, relying on the exemptions allowed for preferential trade agreements. The essential element of these agreements, though, is that they must cover “substantially all the trade between the constituent territories”, thereby preventing precisely the scenario claimed by Hands, where: “You can choose which markets, which products the customs unions affect and which they don’t”. Basically, you can’t do that. Hands should know that. His department should know that. The media should know it. 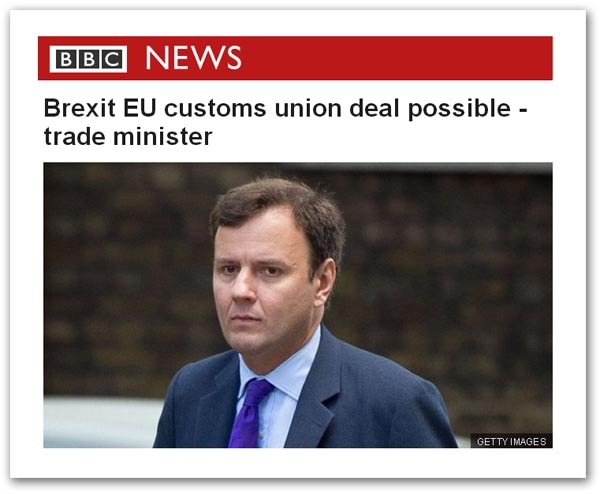 Instead, we get the BBC ignoring that error and repeating the Sky News error, saying: “The customs union includes all 28 EU nations, but also Turkey, Monaco, San Marino, Andorra and non-EU UK territories such as the Channel Islands”. It also repeats the canard that [all] these countries are (by virtue of the customs union) barred from doing bilateral trade deals with other countries. What is particularly ironic is that the BBC, in all its arrogance, runs a series headed: “Brexit: All you need to know”. Yet the very last thing you will get from them and the media generally is reliable information. For all its resource and noise-making capabilities, the media is a disgrace. As Lost Leonardo says, it doesn’t have what it takes. Previous Previous post: Tony Blair & The Undead Rise To Destroy Democracy & Overturn BreXit!